How Do You Create 3D Geometry? Pilot3D gives you many ways to create surfaces and piece them together to get complex 3D shapes. Some ways are easier than others, so it helps to have an overview of the different techniques. This tutorial will give you a feel for the process and point you to more detailed tutorials. The first thing to determine is whether the 3D model you want to design has exact dimensions that you want to match up. Many people want to recreate (as closely as possible) some sort of 3D object. It might be a car or a building. For this, you might want to start with a sketch that shows the basic dimensions and positions. To do these measurements, you need to know something about [X,Y,Z] coordinates. You need to define your object relative to some sort of measuring location or origin. You need to change measurements of length, width, and height into [X,Y,Z] positions. For example, if you want to define a house, you need to define a starting point (origin) for measuring everything, which might be the southwest corner of the lot. This is the point you need to define all [X,Y,Z] measurement points. Then you could say that the positive X-direction goes to the east, the positive-Y direction goes north, and the positive-Z direction goes straight up. All of the dimensions of the house could be changed into [X,Y,Z] values measured from the corner of the lot. A fast way to start in Pilot3D is to define point entities for each critical point on the house; each house corner, each window and door corner, each roof corner, even points that define the key points on the chimney. You can use the Point-Add Point command and then right-click on the point to pop up a dialog box to set the [X,Y,Z] value of that point. As you can see, this is much more difficult than creating a 3D object that doesn’t have exact measurements to match up. Once you have all of the critical points defined, you can snap lines or polylines between the points. This is done with the basic Curve-Add Polyline command, but instead of left-clicking the definition of each point, you position the cursor near one of the previously defined points and press the ‘p’ key on the keyboard. This tells the program to snap (use) the position of the edit point that is closest to the cursor location. OK, but there has to be some method to all of this. The goal is to create lines or edges that you can connect (skin/loft) with a surface. Think of a simple rectangular side of a house with 4 points that define the corners. You could snap a line between the top 2 points and snap a separate line between the bottom 2 points. Then you can use the Create3D-Skin/Loft command to stretch a surface between the two lines. This is a common method for creating 3D objects with specific measurements; define points, snap lines or curves between the points, and then skin/loft surfaces between the lines or curves. [Some designers skip points and go straight to lines and curves to speed up the process.] If the lines or curves define the boundaries of the object, you will end up with a complete 3D NURB model when you are done with the skinning/lofting process. As you will see, converting lines, polylines, and curves to surfaces is a common technique for creating NURB surfaces. Here is a list of these commands, available under the Create 3D pull-down menu. This command takes a line, polyline, curve, or combo curve and creates a surface by extending the curve straight (into the screen direction) based on the view displayed. 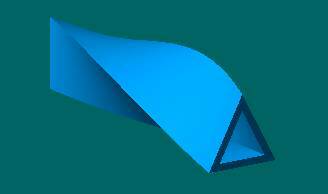 For example, you could take one of the standard 2D airfoil shapes and create a full 3D airfoil by extending the 2D shape for 3 meters. Note that for any of these extrude commands, when it is applied to a polyline or combo curve, many surfaces could be created. For example, if you extrude a 2D square, it becomes a 3D box made up of 4 separate surfaces. The added bonus, which is VERY IMPORTANT for 3D modeling, is that these surfaces are “bonded” or connected. This means that you can edit the extruded shape and the surfaces will not separate. Very few (if any) other CAD programs offer this capability. Surfaces can also be un-bonded or bonded edges can be changed to smooth edges – combining two surfaces into one surface (or vice-versa), kind of like the “knuckle” command for curves. See the tutorial on geometric relationships for more details. This picture shows a straight-extruded combo curve consisting of two straight lines connected with a curve. Pilot3D creates three NURB surfaces and bonds the common edges between the flat and curved surfaces. This means that you can edit the surface edges without having the surfaces split apart. 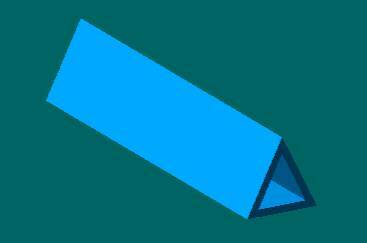 This command creates a 3D shape that starts as a 2D shape and disappears down to a point – kind of like an arbitrary cone, except that the shape is whatever you want. 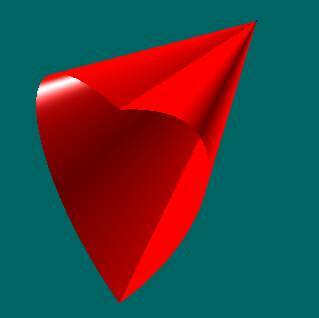 This picture shows two surfaces created by extruding a heart-shaped combo curve to a point. Combo curves are very powerful when combined with the extrusion, shelling, and skinning commands. This command takes a 2D shape and rotates it about an axis (that you define) to create a 3D shape. Think of a lathe pattern that is used to cut out a circular object, like the leg of a table. Note that the rotation angle to use does not have to be 360 degrees, a full circle. This collection of surfaces was created in one step using the Extrude-Rotate command on a single combo curve consisting of both straight and curved sections. This shape was created in about a minute. The surfaces are bonded together so that you can edit the shape without having the surfaces come apart. Since they are separate surfaces, they can have their own colors. 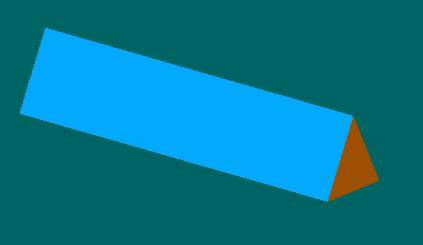 This command extrudes a 2D shape, but follows a curve (that you define), rather than a straight line. This is much more powerful than a straight line extrusion. These surfaces were created by sweeping a combo curve along on curved path. If you look closely in the center opening, you will see the start of the sweep path. As with the other commands, these surfaces are bonded and can be edited without having the surfaces separate. 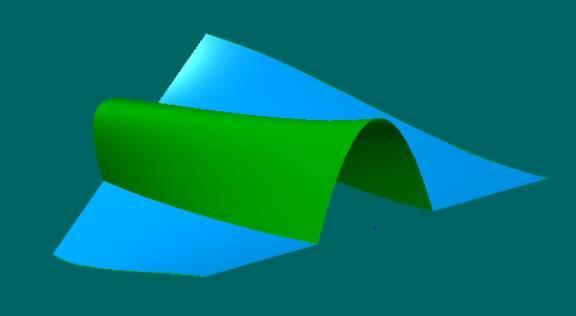 This command allows you to create a 3D surface by moving a 2D (cross-section) shape between 2 edge curves. This is more complicated, but quite powerful. This shows surfaces that were created by sweeping a combo curve along two paths defined at the ends of the straight curve segments. Some programs call this a two-rail sweep. Once again, the surfaces are bonded. This is a very powerful command that creates a surface between two or more lines, polylines, or combo curves. The fastest way to create 3D surfaces is to use this command between two lines or curves. If you have a series of cross-section curves of a more complicated surface, this command allows you to fit a 3D NURB surface that matches (passes through) all of the cross-section curves. If the “curves” are really polylines or combo curves, and if all of the polylines or combo curves have the same number of sections, then this command will fit multiple surfaces between the polylines. This command fits one or more surfaces to a set of cross-section curves. In this case, the curves are combo curves and all of them have the same number of curved and flat sections. The Skin/Loft command will create multiple (3 in this case) surface that fit each section. Pilot3D figures finds the three different sections of the curves and uses those sections to create different surfaces. Three surfaces were created in the example above and the surfaces were bonded to make further editing easier. There are also commands that can give you (without starting with curves) basic 3D shapes. They are listed in the Create3D pull-down menu and below. Each of these shapes can be defined as hollow in the middle. Triangle Solid – the triangle can change shape and twist angle from one end to the other. The triangle solid can be closed and bonded completely with NURB surfaces. The triangle can be any different size on the front and back. 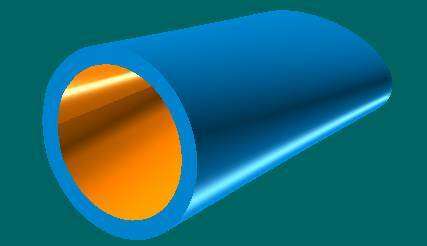 All solids can be defined with any thickness, like a pipe. This picture shows a triangle with all surfaces (inside and out) defined and bonded together. You can edit the shape without having the surfaces separate. You can even put a twist into any of the 3D objects – still all closed and bonded. 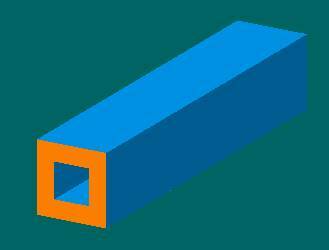 Box Solid – The rectangle can change shape and twist angle from one end to the other. Box solids have the same type of options as the triangle solids. You can define twist and have the dimensions (width and height) of the two ends be different. 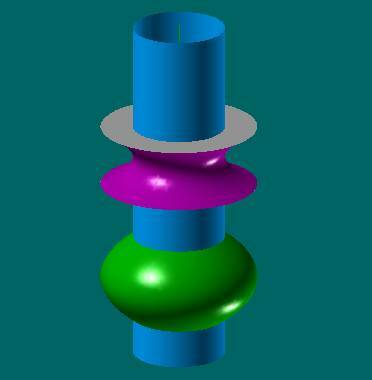 Cylinder/Cone Solid – The shape can change from a circle to an ellipse and can be truncated or skewed. This is a picture of a circle to ellipse cylinder/pipe that was created with one command. The shape does not have to be closed. You could define the shape to cover one-quarter of the closed loop, with the open edges closed off with bonded surfaces. Sphere/Ellipsoid Solid – This solid can be any angle, from a wedge to a full, round solid. This is half an ellipse of a specified thickness with its ends cut off and capped with surfaces. All surfaces are bonded. This was done with one command. Sometimes, one wants to create surfaces that can be unwrapped from a 3D shape to a 2D pattern. Pilot3D allows you to create dynamic 3D ruling lines between any two curves. This is great for cloth patterns, like clothes, awnings, tents, and kites. You can also use this for curved buildings and boats made out of sheets, like plywood, aluminum, and steel. You can edit the curves to get the shape you want and to check the developability of the surface. This means that you can unwrap the shape without any worry of wrinkles or creases. Pilot3D can plot the 2D pattern full size or you can send the pattern to a CNC cutting machine. See the Develop pull-down menu for the list of commands. You can have the program calculate and draw ruling lines between any two curves, as shown above. When you edit (move) any of the edit points, the program dynamically recalculates and draws the ruling lines. The ruling lines will be drawn using colors that define the amount of twist in the surface. If the ruling lines are dark blue, then there is no twist and the surface can be unwrapped with no kinks or strain. As the colors go from dark blue to green, to yellow, and then to red, the amount of twist increases. This technique allows you to dynamically get feedback on developability as you are editing the shape of the curves. Once you get the ruling lines just right (like above), then you can fit a NURB surface through the ruling lines and then unwrap the 3D shape into its 2D pattern, as shown below. No other program has this dynamic ruling line calculation capability. The final 2D pattern can be plotted full size or you can send the numbers to a DXF file to use with any CNC cutting machine. Sometimes, it might be useful to define sections of a surface to cut off or cut out. Pilot3D allows you to intersect surfaces or define curves on surfaces that can be used to trim surfaces. This is a more complicated subject, so you should see those tutorials (and manual) for details. This picture shows a simple NURB surface (with edit points on the surfaces) and a polyline that is attached to the surface. You can attach polylines or curves to a surface with the Curve-Add Polyline to Surf and the Curve-Add Curve to Surf commands. The polyline or curve will stay on the surface even if you edit just like a regular polyline or curve. Use the Surf-Trim Curve command to pick the trim curve on the surface and then pick the part of the surface you wish to trim off. Pilot3D also allows you to edit the shape of the trim curve after you have trimmed the surface. Most CAD programs require you to untrim the surface, edit the shape of the curve, and then retrim the surface. 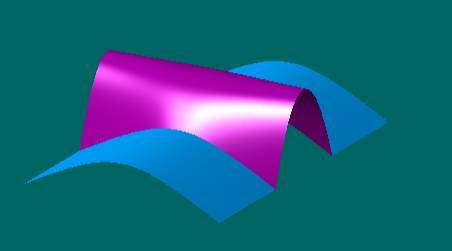 This shows the same surface after the trim curve has been edited. Again, this is done without untrimming the surface. Attaching curves to surfaces to use as trim curves can save a lot of time with the editing process. In many cases, you can create trimmed shapes that are difficult or impossible to do with intersecting or extruded surfaces.